My knitted afghan has one more block. 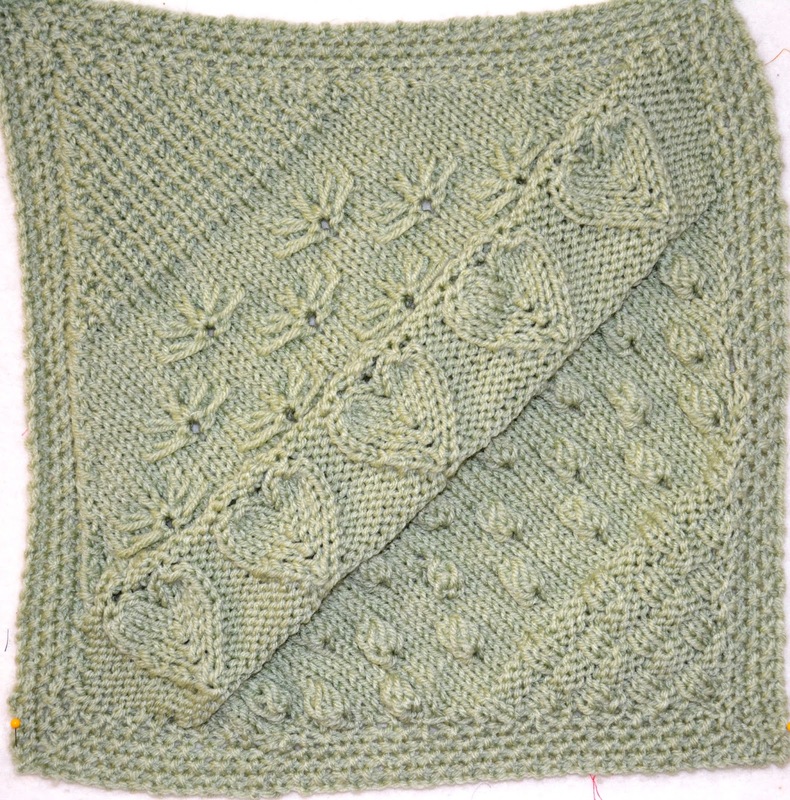 This one, knitted on the diagonal, has some great stitches (basket weave, bud stitch, embossed heart, cornflower, don't know the name of the last one). 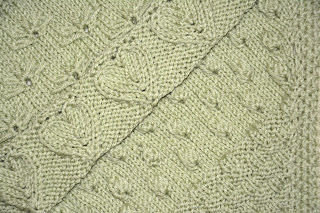 I am not too comfortable with short rows yet, which I worked on when doing the bottom left and top right corners of the block, but I am sure I will have the opportunity to work with them again soon. 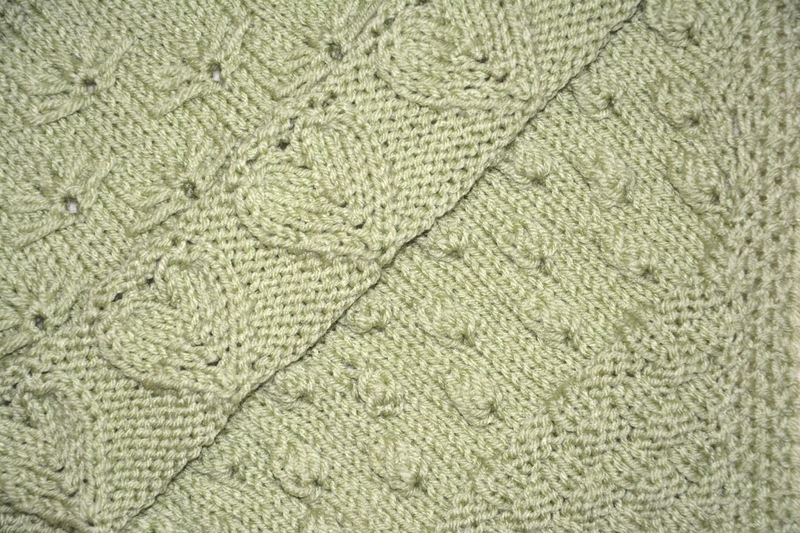 Soon I will show you the butterfly stitch - super easy and also a great one for a baby blanket. For now, I will continue to work on my oldest son's socks; I had finished them but thought the leg was too short, so I picked up the stitches again and am making it longer. As I type this post, the puppy is in his crate, whining and whining. I feel like a total nut by putting him there. I wish he could roam the house but the trainers said he is not ready for it (well, he was doing it before and it was a disaster). Dog training is much for the owners as for the pets... He is supposed to learn to make decisions on his own, to learn to calm himself down (sounds familiar?). At this stage in my life, while having a 13- and a 12-year old at home, it is difficult to have to train yet another being. Back to knitting: I just got the book "60 Quick Knits from America's Yarn Shops". I love the projects in it and can't wait to finish the afghan and the socks to tackle one of them. Or maybe I won't wait. There is a hat (Two-color cable cap) that keeps calling my name, a child's vest with animals that looks easy to make and would look terrific on my grandchild, a felted bag... You get the idea. Is it possible to knit with one's toes? Oh how cute!!! I'm with you - those hearts are simply adorable :*) And if you find a way to knit with your toes, please be sure to share with us! Your knitting is just lovely. Maybe next year I will find time for more practice, so I can try something like this. I feel your puppy training pain. We are going through the same thing here and it's a strain to get anything done. Good thing it doesn't last long! 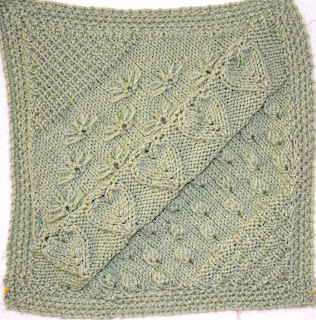 could you please direct me to the pattern for this afghan? So pretty!